A game that featured superb pitching and dazzling defense came down to a walk-off walk. Tony Wolters drew a four-pitch bases-loaded walk off Arodys Vizcaino with two outs in the 10th inning, sending the Colorado Rockies to a 3-2 win over the Atlanta Braves on Saturday night. "I was just looking middle-away, trying to get my pitch, put a hit out in the outfield," Wolters said, "and I never got that pitch." He got mobbed by his teammates just the same. "It's pretty cool having all my teammates come out and throw everything at me," said Wolters, who was doused with water. "I just knew that he didn't have a good feel with his fastball," Wolters said. "And once I saw that he was coming back with his fastball, I was like, `I'm going to take until I get two strikes and just feel him out because he doesn't have good command.'" Facing Wolters with the bases full was "obviously a difficult situation," Vizcaino said. "Make any mistake and the game's over. Just one of those things. Pitches weren't falling in the zone." 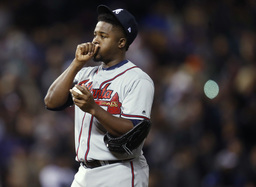 "He kind of got out of whack and was having a hard time regrouping himself," Braves manager Brian Snitker said. "I thought with the breaking balls, when he walked the hitter before, maybe he was trying to get him to chase, get himself out. He kind of got out of whack there and it's kind of a tough spot to try to work your way back. He started out firing the ball really good and it kind of got away from him." Wolters looked at four straight pitches out of the strike zone, making a winner out of Adam Ottavino (2-0). The right-hander escaped a jam in the ninth when shortstop Story leaped to snare a two-out line drive by Nick Markakis that otherwise would have brought home Ozzie Albies from third. After Ryan Flaherty tied it with a single in the ninth off Rockies closer Wade Davis, Atlanta's second baseman saved the game - momentarily - with a diving catch of DJ LeMahieu's line drive up the middle for a rally-snuffing double play. Wolters, who might have scored the winning run, instead was doubled off second base. "That's the beauty of the game," Rockies manager Bud Black said of the pair of defensive gems by middle infielders. "You don't know what's going to happen - and we saw a walk-off walk." COOLED OFF: The Braves went into the game with the major's most productive lineup, averaging eight runs a game and leading the majors with a .298 batting average and a .381 on-base percentage. But they were stifled by Bettis and the Rockies' refurbished bullpen until rallying in the ninth. STILL UNBEATEN: Anibal Sanchez is unbeaten in six career starts against the Rockies. He allowed two runs and seven hits over five innings. He struck out six and walked a pair of batters before leaving with Atlanta trailing 2-0 after five innings. Story homered for the second straight game, sending a fastball into the left field seats in the fourth, one inning after Nolan Arenado singled in a run . Freddie Freeman's RBI double with two outs in the sixth made it 2-1 and chased Bettis. Braves: 3B Johan Camargo (right oblique strain), who went 0 for 4 Friday while playing shortstop for Class A Florida, will move his rehab to Triple-A Gwinnett after DHing Saturday. "He feels good, health is not an issue," Snitker said. "It's just about wanting to see some pitches." Rockies OF Charlie Blackmon battled through a stiffening back and was replaced by defensive sub Mike Tauchman to start the 10th. Atlanta sends LHP Sean Newcomb (0-1) to the mound Sunday in the series finale, and Colorado counters with LHP Kyle Freeland (0-1).